As Christian Nielsen takes the road less travelled this summer, he uncovers the volatile, violent past hidden under the tranquil, peaceful present of the Dutch village of Overloon. Set in the verdant woods of Overloon, in the Dutch province of North Brabant, is one of the first and finest museums to recount and remember World War II’s European chapter. Started in 1946, just one year after hostilities ended, the cavernous Oorlogsmuseum Overloon takes visitors on a journey from the ominous failure to reset the world order after WWI ended in 1918, to the seeds of national socialism and resulting polarisation leading to a sense of German exceptionalism and eventual invasions of Poland, the Netherlands, Belgium and so on. The sombre exhibits capture the utter despair of life in occupied Netherlands, the deprivation, humiliation, torture, fear … what it was like as a child, parent, student, worker, etc. It dutifully recounts the systematic rounding up by the Germans of the Jewish population during the war years until liberation by the Allied forces in 1945. In one segment, visitors meet a 10-year-old Jewish girl and her family as they struggle to survive. The loneliness and heartache she faces as her mother dies of a brain tumour, her brothers are taken to a labour camp, followed by her father, cousins, aunts … They all disappear from her life in the space of five years. She goes into hiding with her grandparents, moving from one place to the other, and eventually to a secluded farm. After liberation, she is reunited with her grandparents, and they soon learn the fate of her parents and brothers – all lost in the camps. Multimedia displays including clips from the period projected on to walls, floors and windows surround the visitor. The overwhelming collection of original mementos, artefacts and machinery would be hard to beat anywhere. The military hardware in the adjoining hall is thoughtfully displayed to capture what it might have been like in the dying days of the war as the Allies pushed through to the German border in late 1944. Operation Market Garden was an Allied push through Belgium and Holland to cross the Rhine at Arnhem and get round the German’s heavily fortified Siegfried Line in preparation for a final drive to Berlin. It was a make-or-break moment and the Germans knew it. They pushed back and met the Allies across a looping front that also took in Belgium (best known for the Battle of the Bulge) and German territory (fierce fighting in Hurtgen Forrest). These clashes were an all-in effort by a German army that literally had everything to lose. And it was in Overloon that Market Garden reached a crescendo between 30 September and 18 October 1944. The story of the Overloon Battle is told with great care and detail in a panorama room with a replica shelter below, which tells the trials and tribulations of thousands of frightened civilians who waited out the nearly three-week-long ordeal. A number of sculptures line the pathway to the entrance of the museum, symbolising the twin evils of war: shattered lives and destroyed livelihoods. One installation (see photo) sits incongruously beside a WWII-era tank with its turret poised in the air. The €15 price to enter the museum seems steep at first but as the sheer magnitude of the place begins to open up, and the attention to detail (the personal stories juxtaposed against the carefully arranged machinery of war) is appreciated, the money feels well spent. Curators are everywhere, dusting Howitzers and arranging life-like mannequins into new scenes like the battlefield mess tent and mobile tool shop. 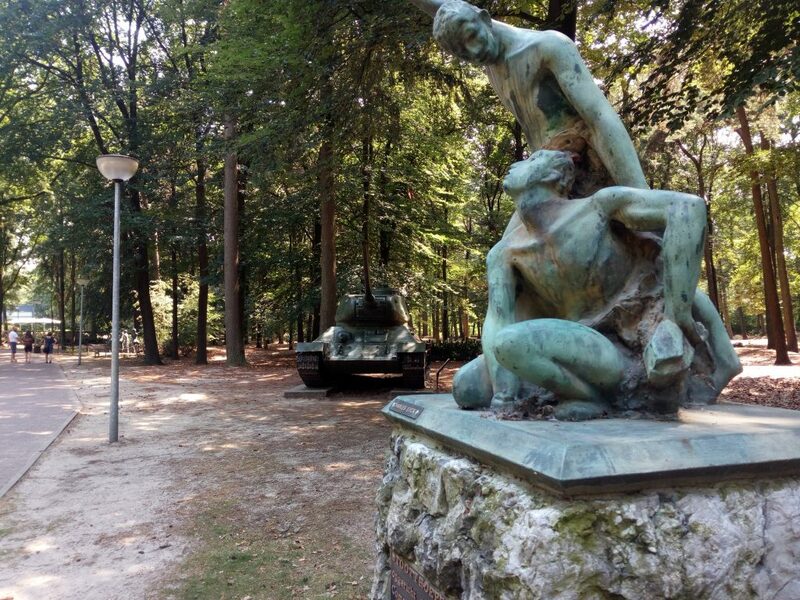 Combined with several military memorials and cemeteries in and around Overloon, as well as a new playground and nature activities, this is a day well spent … and not only for history buffs.